Well, I was wrong...more than 3 people entered my poetry contest. Way to go, people. I wish dirt bikes just could fly. Just like seagulls in the sky. I end up doing a deep dive. come on, let's melt wax. Pay full price...are you silly?! The best price is FREE! I know...my favorites lean heavily toward the Haiku. Click here to read all of the submitted poems. Race Cars Crash, yup, bang! For the rest of y'all this means you've got some work to do next time: my brother's family has won 100% of the prizes I've given away on my blog so far. Let's see if we can't break that streak. I'll have to consult with my contest advisor to figure out what we'll do next (my 500th(!) post is coming up soon)...stay tuned! Our family does not own any pets, mostly because I already have enough to take care of, what with the 4 boys that live here. And let's not kid ourselves, it would be the mama doing the pet care-taking, even if the children pinky promised to do it. However, we've had a couple of pets choose us over the years. 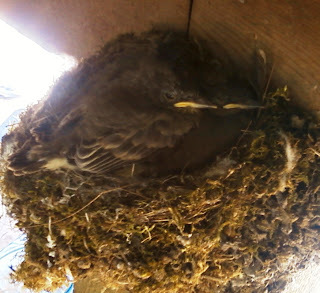 Currently, we have a bird family living on our porch (I posted a pic of the babies, taken June 5, here). Well, here's an update. They're getting bigger and louder, and they actually have feathers now (sorry about the poor picture quality--once again, Hubby's off somewhere with the real camera, and my phone camera does not have a flash--but I thought I should get another pic before they're off into the big world). ﻿We also spotted our first monarch caterpillars of the season on our way home from a bike ride this afternoon. This is the earliest I've ever seen them, and the smallest I've ever seen them--Tiny is just 5 mm long. We've also taken in Hector, who is 15 mm long. I convinced MC that we should measure them every day and write down our observations, but he tells me this is not going to be his 3rd grade science fair project--I'll keep hoping for a change of heart (I think it's my turn again, and I'd like to get it out of the way as soon as possible. Of course, since I'm planning ahead, I'm sure they'll change the rules on me--they always do). These are the kind of pets I like. The birds take care of themselves--all I have to do is leave them alone. The caterpillars require fresh leaves daily and cage cleaning every couple of days, but only for about 2 weeks, which is about the length of time that I can count on the children taking care of a pet before they lose interest. And, just a reminder: there's still time to enter the Accidental poetry contest. You have until Friday at midnight central time to post a comment here with an original poem. I will post some of my favorites on my blog next week, and for each poem submitted, you'll receive one chance to win the fabulous prize. The winner of the fabulous prize will be chosen at random. A couple of weeks ago, I posted my review of Plain Wisdom, a book that offers a peek into the Amish lifestyle. I have to be honest. I've always wondered why anyone would choose to live they way the Amish do--not in a disparaging or judgemental way--I've just wondered what their reasons are: no electricity? no motors? Really? Are those things bad? Does God not approve? I mean, what could be so bad about something that makes our lives easier, better? Right? Just as I question the Amish lifestyle, I am absolutely certain that there are those who would question some of my family's choices, for instance: making sure we have money to pay for something before we buy it, therefore not racking up credit card debt; buying a less expensive house than the mortgage company said we could afford; paying cash for our vehicles. Whenever possible I borrow or buy things used, and I try to avoid paying full price for anything (because why would you pay full price when you don't have to?). We do not have the latest and greatest gadgets; we do not run out and buy the next big thing as soon as it's available. We are blessed to have all that we need, and so much more, and I am, we are, content. But the world says if you want it, you should get it, no matter the consequences, no matter the cost. I am so thankful every time I pull a load of clean, good-smelling laundry out of my washing machine, because I didn't have to wash it by hand. I am so thankful every time I put a dish in our automatic dishwasher, because that means I don't have to do the dishes by hand. I am so thankful, especially today, that I have an air conditioner so I can bring the temperature in my home down to the point where I'm not sweating buckets just by sitting. My goodness, the Amish don't even have fans to help cool them down. I mean, I think it's kind of fun, when our electricity goes out, to break out the oil lamps and read or play games or eat supper by candlelight, but let me tell you, it sure is nice to be able to just flick the lights on whenever I want to. I've decided that the Amish lifestyle is not for me. Even so, as I was reading Plain Wisdom , I had an "ah ha" moment. You see, all of this technology, all of our time-saving devices, make everything we do easier (OK, not exactly everything), so we can do it faster, so we can do more. And because we can do more, we think we should do more, and we do do more. We rush from task to task, feeling scattered and stretched, and we wonder how we're going to fit everything in. We lose hours fiddling with our phones, our computers, our iPods. We cultivate artificial online relationships, rather than investing our time and energy in nurturing relationships with the flesh and blood people surrounding us. Sound familiar? But what if we decided not to do more? What if we took the time we were saving to savor life? What if we chose to live simply? Being Amish isn't always easy. Sometimes our rules and guidelines make life a little harder than I'd like. Yet doing without holds blessings too. If I had a car, I'd whiz around in all my busyness instead of enjoying the slow pace of a relaxing buggy ride on a beautiful afternoon. Leaving it all in God's hands, I think Him for the challenges as well as the blessings. I love that: "doing without holds blessing, too." This passage struck me to the core, especially at the end of this busy school year, when I have so longed for less: less busyness, less rush, less chaos. So while I'm not going to ban electricity in our home or rid our life of motors, and I don't pretend to know all of the reasons why Amish folks make their lifestyle choices, I can see how this way of living that the world sees as limiting and restrictive allows adherents the freedom to live each moment, and to experience joy in the ordinary. The rest of us, we think our devices and machines give us freedom; we seek joy in more: having more, doing more, being more. But true freedom, true joy, comes from nothing more than placing our trust in an eternal Savior. To read my first post about our Memorial weekend, click here. So, on Sunday, we dropped Sawblock and Code-man off to do some kayaking. In the background of this photo, I was attempting to show just how unextreme the river looked at this point, but I don't think I quite succeeded. We saw this fearsome beast at the put in before the guys set off. Can you see how menacingly he's raising his hands? Whew! That was a close call. The rest of us decided to head to the Lake Superior Zoo to check out some other fearsome creatures, these ones located safely behind fences or glass. I have to say this zoo was scenically the most beautiful zoo I've ever been to. There was a gorgeous river running through the grounds (really, it was, even though you can't see much of it in this photo), and it was just a very nice place to be. There were real creatures at the zoo as well, it's just that it was not as easy to photograph my children with, say, the polar bear, or the tiger. As I said previously, they were all behind glass... or at least fences. And what were those other guys doing during this time? Well, this (click for the video), among other amazing kayak-y feats. They met up with a group of 3 other kayakers who were systematically kayaking some sub-set of rivers (I forget now what Hubby told me they were doing) with video cameras. Apparently, my husband and son kayaked this section of the river. As you can see from the lack of kayaks in this picture, I missed it. It looks a bit more extreme here. But while we were waiting in vain for Hubby and Code-man to appear in their kayaks, Bubby decided to become a tree-hugger (doesn't he look tall in this picture? ), and MC did some more climbing--you can't really tell from the picture, but he was breath-takingly high, and this was actually taken when he was already on his way down. So, I opened this set of posts saying that our camping trip was rainy and cold, and based on these pictures, you're probably wanting to call me a liar at this point: maybe it looks cold, but it certainly doesn't look rainy. Believe me, it was both: we made a few mad dashes to stow equipment, and even had hail on Saturday evening. But the rain managed to fall mostly during our rest times and breaks or while we were away. The only activity we had planned that we didn't get to do was riding on the Timber Twister, which is an alpine roller coaster. Next time. So yes, we had a great time. Don't forget to enter my poetry contest. To enter, click here to leave an original poem in the comments. When people ask me how our Memorial weekend camping trip was, they tend to look at me funny when I tell them that it was cold and rainy and we had a great time. Truthfully, I almost can't believe it myself. I mean, it was cold (40 degrees) and rainy, which usually would not make me a very happy camper. Maybe I've grown as a person or something. We had a great campsite--this cliff was just a few feet from where we set up our tent, and the boys spent quite a bit of time climbing. Bubby climbed, too, because he has to do everything the brothers do. Which meant that mom and dad did a lot of climbing, too, although honestly, I'm not quite sure what I could have done if he'd actually fallen, other than cushioning his fall when he knocked us both off. On Saturday, we climbed "our" cliff, then the one behind it, and came to a path, which led us to this fallen tree. More climbing. And there was yet a third cliff to climb behind that. When I took this picture, I was hoping that Sawblock would get out of the shot, but his height adds perspective, which is good, yes? Also on Saturday, we took a hike down by the St. Louis River. It was gorgeous. After walking over a swinging bridge and admiring the river for a while, we set off to find a serial geocache in the park. Here's Bubby, consulting the map before we set out (is this seriously not just the cutest thing you've seen all week?). Just for the record, I saw this birdhouse when we first arrived in the area, considered, and immediately discarded it as a geocache location, thinking the park people wouldn't want us to disturb the birdies. Those sneaky park people! It was a fake birdhouse! The next cache was on the back of this trail map sign, cleverly disguised as the back of a trail map sign. Our third stop was a cache hidden in a hollowed-out, hinged log. Very creative, park people: I'm impressed. We found the last cache. We then sat on a bench and watched some other poor fools try to find it :) Good times! What's kind of fun about the Minnesota State Parks geocache safari is each park has its own collectible wildlife card hidden in the final cache, picturing an animal the park is known for. This one was particularly fun, because in addition to giving us puzzles to solve in each cache in order to get the coordinates for the next cache, they gave us a clue to the wildlife's identity. We had a great time guessing on the way. And no one guessed correctly. I won't tell you what it is, 'cause I don't want to spoil the surprise. Funny story: there had been a note posted for geocachers telling us not to go down a certain way, because although we could get to the next cache that way, we would have to bushwhack to get to it. So, we dutifully turned around, and went the other, non-bushwhack-y way. However, on the way back, we didn't want to backtrack, so we went up the way they told us not to go down. MC was carrying a stick at this point, and every time he saw some shrubbery, he would hit it with the stick. After a while, Sawblock noticed this strange behavior and politely inquired about it, to which MC replied, "I'm bushwhacking." Um, MC, you don't have to actually whack the bushes unless they're in your path. That's so like him, though: he's a very literal kid. Gotta be careful what you say around him. Don't tell him I told you, 'cause he'll just give you that look he has, trust me. **Special note to people who read my blog via email: with all of those pictures in there, the formatting is a little funky, and I'm not quite sure how that will translate to email. If it looks weird or is too hard to read, you can just go to my blog (http://bluefield5.blogspot.com/) to read it. Code-man's 5th grade class wrote a lot of poetry this year, and published their poems in books at the end of the school year. To celebrate their efforts, they hosted a poetry coffee house this week (Huh. It just occurred to me that I didn't see any actual coffee at the coffee house--just as well, because it was pretty darn hot in there). Each of the kids got up and read a couple their poems. The time passed by so quickly. Chip says I should host a poetry contest on my blog, and I say "why (would I want to do that? There would be) not (more than 3 people who would actually enter)?" So leave a comment with an original poem. Heck, feel free to leave 5 or 10, just so it looks like I've gotten a lot of response. I'll post my favorites in, say, a week. I'll even draw a random poem to receive a fabulous prize (that has some restrictions). Black is the night sky. It is a black cat running by. Black is space and all that is in it. Black is rich soil and a pit that has no end. Black is a storm cloud waiting to rain. Black is a stormy night. It is the spent coal after the fire. Black is a quiet lake at night. Courage is like a boulder. but can have cracks and dents. and can stand up to great forces. It is carved out by different events. So, these are the itty bittys whose mom made a nest on top of a post under our porch roof. They're just all fuzz and beaks. Hard to tell, but I think there are 3 of them, and I'm pretty sure they were 2 days old or less when I took this picture. I'm also pretty sure these little guys don't eat corn...yet. Which brings us to the title of this post. I've invited myself over to my sister-in-law's mother-in-law's house this summer to blanch and freeze corn (thanks so much for having me, KD!). I'm told they use their turkey fryer to keep the water boiling and make an assembly line out of it. Sounds like a lot of (hot) work, but also a lot of fun, and the corn my sis has preserved this way is the best I've tasted (besides fresh, of course). Here's some information about blanching and freezing corn from the University of Illinois Extension. So I was thinking, hopefully I can convince KD and Chip that we need to make these caramel corn ice pops from the June/July issue of "Every Day With Rachel Ray" during one of our breaks. Yes, I said I want to make popsicles out of corn. Rachel assures me they taste like caramel corn, and Rachel wouldn't lie. Besides, I think it would be fun. I'll bring the popsicle sticks, girls! And, in corny conclusion, as some of you know, my oldest son has a summer birthday. His teacher told the kids that if anyone with a summer birthday wanted to bring in treats, they could do it this week. So we made a plan. I was to buy 18 ice cream sandwiches, plus a gluten-free treat for one girl and a sugar AND gluten-free treat for another girl, and bring it all in around 10:45 for snack time...it was a great plan, and very easy (well, except for the gluten and sugar free part)...until Code-man saw my July issue of Woman's Day magazine. Then he decided he needed corn on the cob cupcakes. I wish you could all be here to see them in person, 'cause they're pretty cool looking. Those are jelly bellies (yay for Knoke's!) for the corn kernels, and I used taffy for the pats of butter (good call on the taffy, Hubby!). If you read the recipe, you'll see that they say to make your cake and frosting from scratch. You can rest assured that I did not do this (I used yellow cake, of course). They also used black and white sanding sugar for salt and pepper, but I didn't feel like I had the time to go to a specialty baking shop, and our local grocery store (for some strange reason) does not sell black sugar at this time of year. Camp Scarlet was in session this morning for the last time for this school year, and oh, what a glorious day we had! The colors were so vivid and beautiful, and the kids learned a little something about mixing colors. We used paint brushes to apply the paint to our driveway. When it dried, it looked like chalk. Pal and Car even did a little experimentation by painting over some of their "real" sidewalk chalk drawings. Very fun, and, just like sidewalk chalk, the rain will wash our canvas clean. So, I just have to inject, here, that I was actually planning on making our own sidewalk chalk, however, I neglected to actually look up the recipe until last night, when I discovered that we would need plaster of paris, which, unlike corn starch, we don't just happen to have on hand, for that. So...next time we'll be using this recipe from Family Education to make sidewalk chalk. And, to inject again, I was planning on making Mega Bubble Blowers today as well, from the May issue of Family Fun Magazine, but forgot to buy glycerin for the bubble solution, and I wasn't entirely sure where around here my husband has hidden the dowels he assures me that we have, so we'll add that fun activity to our sometime-in-the-future list as well (as I'm writing this, the instructions are not yet posted on Family Fun's website, but when they are posted, they'll be here). Valerie has some awesome pictures of her family's mega bubbles here, if you'd like to see. Anyway...back to the outdoor Camp Scarlet fun. The kids brought their bikes and had a great time riding around up by the garage. With no collisions, even. Added bonus: before today, Bubby needed intensive parental assistance to ride his bike--he would get stuck and not be able to get going again (you know how that happens sometimes, when the pedals are in just the wrong spot to start and you need to push really hard?) without a push. Well, today, since I was needing to assist three children, Bubby got tired of waiting for me to get to him and figured it out himself. He was rocking it! At this point, I needed a break, but the kids were still good to go, so after a quick drink of ice water, we headed back to our swingset. I'm not quite sure what was going on, but I do know it involved monster eyeballs and a waterslide (complete with real water, J, just in case you were wondering how the seat of Car's pants got so dirty). After lunch, inspired by the back yard "waterslide," the kids donned their swim suits and we headed for some fun in the sprinkler(s). We even used this tarp for a slip-n-slide. We'll need to get some smooth plastic for the older boys this summer, but the textured tarp was perfect for the little ones--the friction kept them from going too, too fast. And now, my friends, I think it's time for me to stop typing and start taking advantage of rest time :) I need to be ready for round 2 of biking in less than an hour, probably followed shortly thereafter by round 2 of slipping and sliding (this time with the big boys).